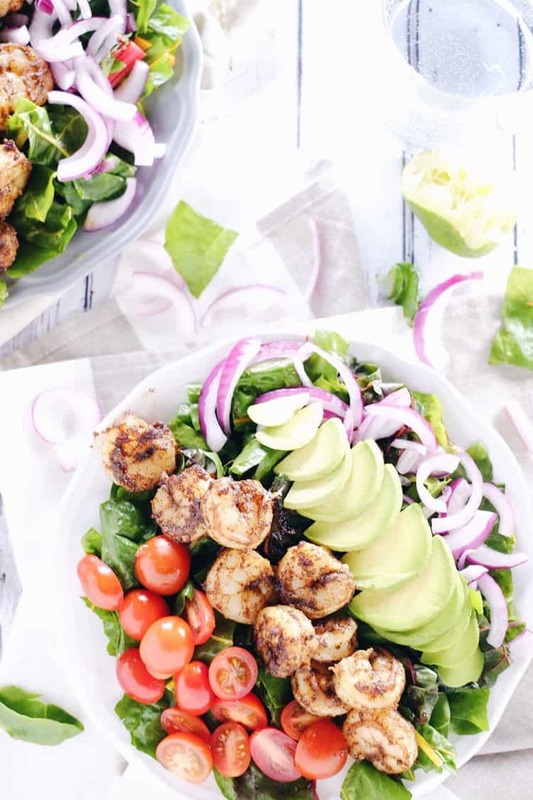 We really love spicing up our life with food, and this Cajun shrimp salad is a fresh way to liven our salads up! It is so easy to get stuck in a salad rut. Do you ever feel that way? We typically will just chop up whatever fresh veggies are in the fridge to add to a bowl of greens, and then drizzle our everyday salad dressing, or some variation of it. If we are feeling a little daring, we might add some tuna salad on top! Justin’s mom cans wild caught tuna from when the guys go fishing, and now Chicken of the Sea will never be an option again. There’s no better tuna than fresh caught and canned at home. 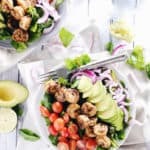 The Cajun flavor of the spices combined with the creaminess of avocado and tartness of lime really adds a kick to this salad, so that each bite feels like your taste buds are twirling and doing a little happy dance. Ok, true story…the first time we made this Justin put way too much Cajun seasoning on the shrimp, and it ended up way much too spicy for both of our palates. I got the hiccups because that is what happens when I eat spicy food, and we ended up having to eat watermelon afterward to cool down our mouths. Rest assured, we have the right amount of spice dialed in now. Look at all the colors, all of the textures, and imagine the array of flavors. It is so good! We also love how easy and quick shrimp is to make. It ensures that you will have this tasty little salad served up in hardly any time at all! 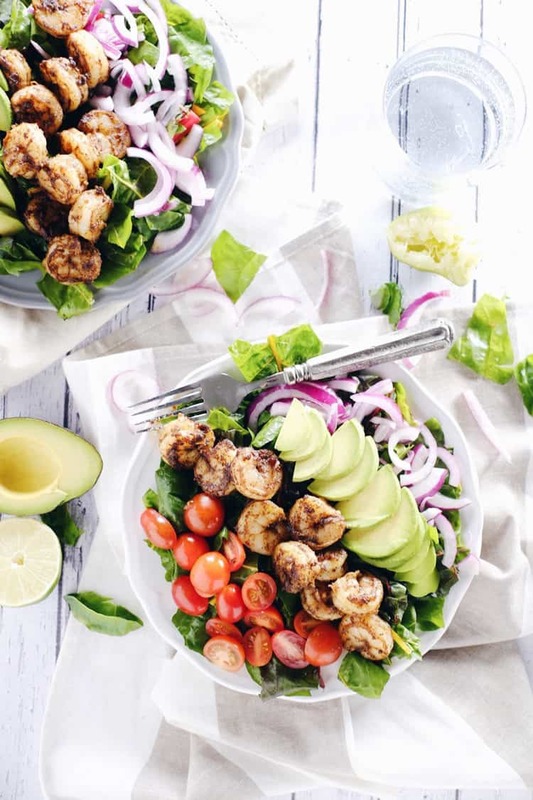 Are you ready to go make a Cajun shrimp salad, or what? Get to it, and let us know how it goes by leaving a comment below. Then, tags us on Instagram @realsimplegood so we can see! In a medium bowl or dish, season shrimp with spice mixture and toss to evenly coat. In a large skillet over medium-high heat, add 1 tbsp oil. Once hot, add seasoned shrimp and sauté until the shrimp turn pink, about 2-3 minutes. Remove from heat and set aside. Now, create your salad. 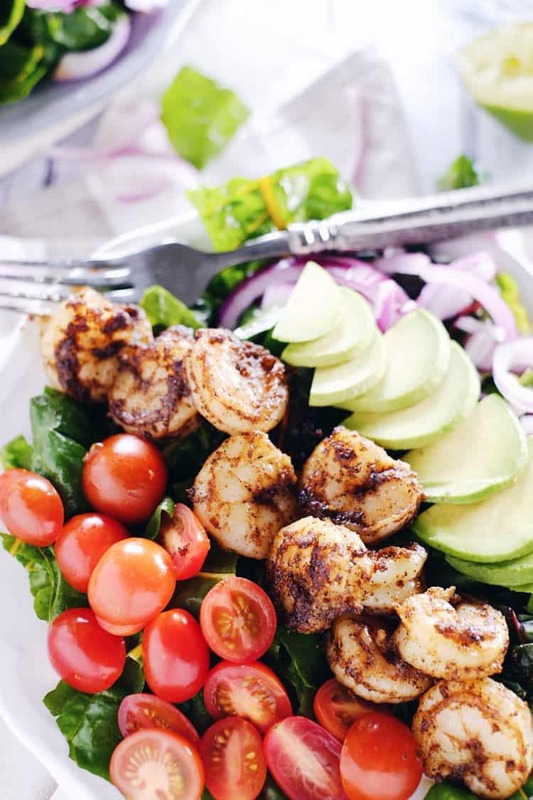 Fill a plate with greens and arrange Cajun shrimp, onion, tomatoes and avocado in separate rows. Drizzle with oil and a liberal squeeze of lime juice. Serve and enjoy.